If done right, you will recognize them from the scent: flame-grilled meat and smoldering mesquite with a whiff of warm masa. The crowds, too, are a heartening sign, snaking out from pop-up canopies festooned with lights and shrouded in smoke. But one of the most direct ways to confirm that you are in fact at a practitioner of tacos estilo Tijuana is to look for the guacamole—a dollop of thick, mashed avocado that caps the tortilla-bound construction like whipped cream on a sundae. 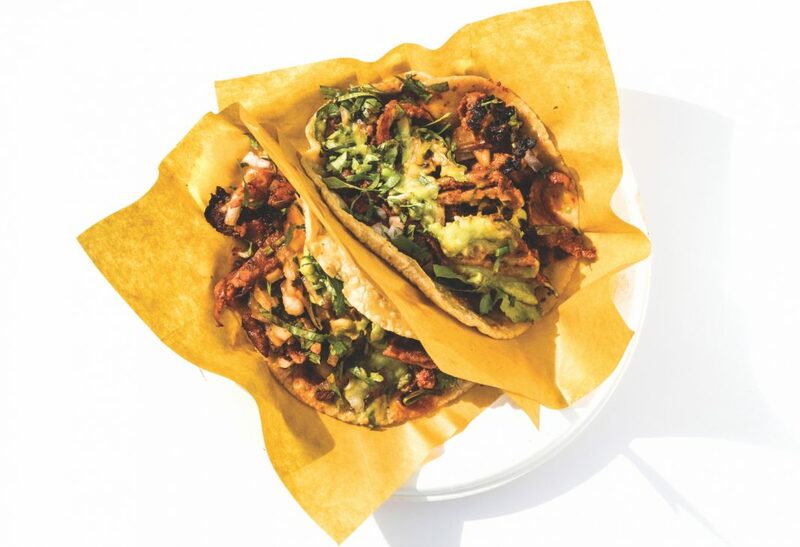 Over the past year or so, the “Tijuana taco,” as it is often called, has emerged as L.A.’s taco of the moment. Street operations such as South L.A.’s Tire Shop Taqueria and Tacos Los Poblanos attract half-hour-long lines on weeknights. Out in the Inland Empire city of Colton, fans queue up even longer at Tacos La Central, a vintage drive-in-turned-taqueria opened in 2016 by part-time college professor Gustavo Buenrostro and marketer Victor Paniagua. Then there are vendors that have accumulated Instagram followers by the thousands: Ah Carbon Tacos in Montebello, Angel’s Tijuana Tacos in North Hollywood, Carlos’s Tijuana Tacos in Whittier, to name a few. Though immensely popular in the city of Tijuana, the origin of this particular style is more complex than it might appear. The tacos are usually filled with a handful of cleaver-chopped beef, a reflection of the protein’s popularity in Baja and beyond. But the taqueros themselves often hail from Puebla, drawn northward by demand for their quick-wristed assembly skills. Wrapped into cone-shaped bundles using corn tortillas in lieu of the regionally prevalent flour, the tacos are, in a sense, for connoisseurs. The quality of meat is promptly apparent; toppings are kept to a minimum. There are no shortcuts in preparation, a calibrated blur of chopping, sluicing, and folding. The Tijuana taco demands as much as it provides. Previous articleJust How Big Is Shen Yun’s Marketing Budget?